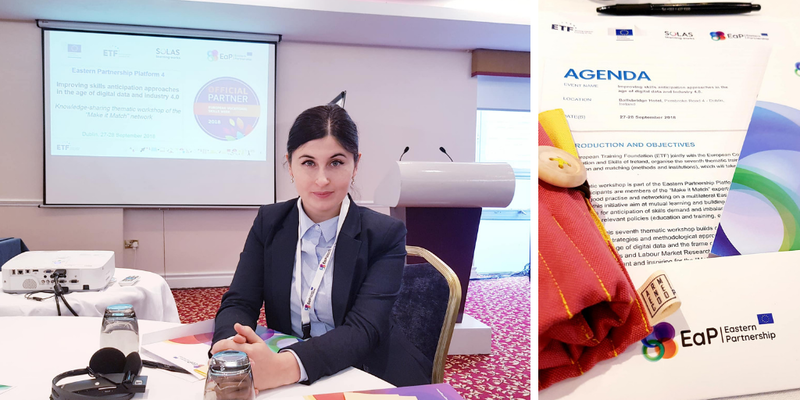 On 27-28 September, Eastern Partnership Civil Society Forum (EaP CSF) participated in EaP Platform 4 thematic workshop “Improving skills anticipation approaches in the age of digital data and industry 4.0” in Dublin, Ireland – looking at labour market, education and challenges brought by new technologies. Ana Indoitu (National Youth Council of Moldova) represented the Forum, presenting the situation in each EaP country – focusing on vocational education and different policy approaches, used to address growing demand for certain skills. The aim of the workshop was to facilitate exchange of best practices and capacity-building within EaP Platform 4 “Make It Match” experts’ network. Aside from becoming familiar with institutional arrangements and existing forecasting mechanisms in Ireland – the host country, those taking part in the workshop had a chance to get to know EU’s instruments for matching skills and occupations – presented by EURES Mobility Portal and ESCO – European Skills, Competences, Qualifications and Occupations team. The presentation gave way to discussion on the need to introduce similar, institutionalised research and data-collection mechanisms in the EaP countries, addressing skills and labour market tendencies. At the present moment, there is not enough sector communication and participatory policy design – especially in new and emerging fields, such as artificial intelligence, augmented reality or robotics. What is more, civil society could be a capable partner in private research and play an important role in advocating for better, more effective policy design and governance. Presenting EaP CSF position paper, “Skills of the future – a road to participatory design” to workshop participants, representatives of the Irish government and other EU stakeholders, Indoitu said that “there is a need for better matching of skills with labour market demands” in the EaP countries. Even though vocational education is increasingly on the agenda, there is still a dissonance between study or training options and private sector development. That is really the question that needs redressing – before we start talking about migration or the countries’ large informal sector, warns Indoitu. There is a need for stronger institutions and faster pace of educational reforms, is one of her conclusions.